To see what events are planned in your state/region, please go to "A comprehensive list of events and festivals celebrating the NATIONAL ECLIPSE on August 21, 2017" – http://nationaleclipse.com/events.html. A planned special event for which there has been no recent precedent in the United States. A planned special event that is a feat of nature and not man-made. A planned special event with many different events across the country. An act of nature that is not a disaster. Where: Refer to Figure 1 map. Who: Approximately 200 million people (a little less than 2⁄3 the nation's population) live within a day's drive of the path of this total eclipse. Why the Fact Sheet: To make you aware of the 2017 eclipse; to provide the link for events and festivals in your state to celebrate the event, and if appropriate, to provide information should your state need to develop transportation plans. 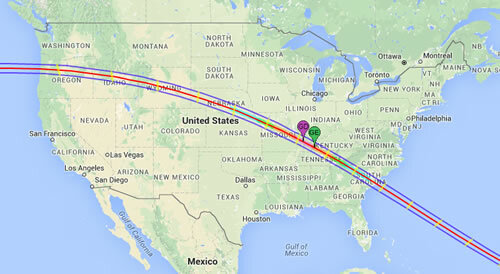 Map shows the path of the 2017 total solar eclipse across the United States. The Greatest Duration (GD) and Greatest Eclipse (GE) markers show the points of greatest duration and greatest eclipse, respectively. Figure 1. Map. Total solar eclipse path on August 21, 2017. Source: National Aeronautics and Space Administration. Developed partnerships with WAZE (or other user-based app)? Real-time information is likely to be valuable as most of the path is through rural areas where any congestion and closures might be unexpected.